PM - Begin at 868 Estate Vineyards with a tasting of their award-winning wines paired with food prepared at their farm-to-fork restaurant, Grandale Vintners Table. Sitting near the foothills of the Blue Ridge Mountains, this vineyard boasts spectacular views in the middle of this breathtaking Virginia landscape. Following the tasting, enjoy lunch on site featuring seasonal and local ingredients crafted into delicious plates to please any palate. Visit Fabbioli Cellars, home to Winemaker and Owner Doug Fabbioli, affectionately known as ‘the Godfather of Loudoun Wine.’ Enjoy a wine pairing in the barrel room located in the circular tasting room facility. What began as a family winery with two varietals, has quickly grown to several varietals and even a hops farm on the property, making Fabbioli Cellars a Loudoun County staple. 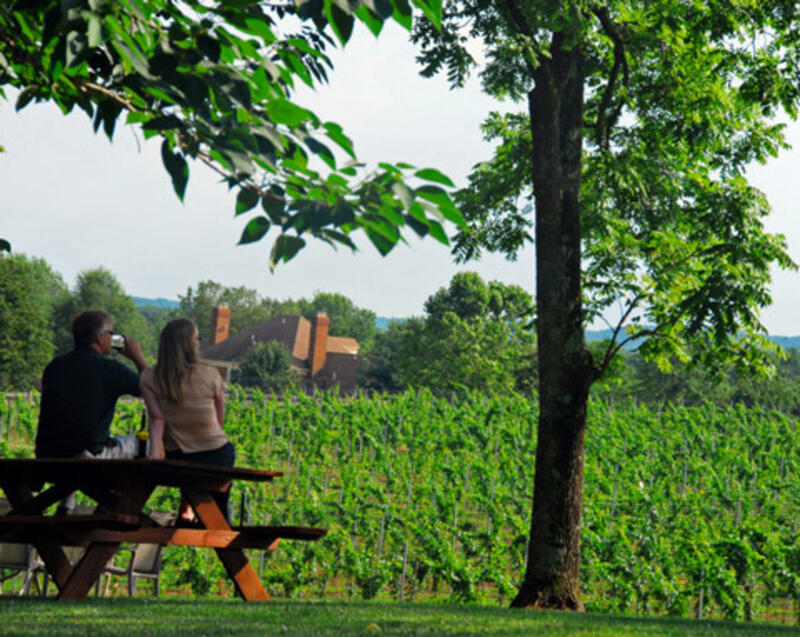 During a tour, learn how wine is made, see the processing facility, enjoy beautiful vista views and discover what makes Virginia such an up and coming wine destination. Known to the locals as ‘Tuskies’ Tuscarora Mill is a favorite! Housed in a 19th-century grain mill in historic downtown Leesburg, it’s considered by many to be a Loudoun institution highlighting fresh and local cuisine in its historic atmosphere. Dinner will feature hand-crafted dishes with locally sourced products, specifically chosen to pair with Loudoun County beer and wine. AM - Begin the day at Morven Park, one of Loudoun’s must-see attractions. This 1,000-acre historic estate features a restored Greek revival mansion that was once the home of World War I-era Virginia Governor Westmoreland Davis. The home features artifacts collected by Governor Davis from his trips around the world, including 15th-century Persian tapestries, Asian treasures, several China sets and a Tiffany lamp. Throughout the tour, learn about the history of the Davis family, Virginia agriculture, architecture and more. Following the tour, visit the Winmill Carriage Museum on property, housing 40 antique carriages, coaches, sleds and carts from varying eras. Sitting atop Hogback Mountain, the views are unprecedented at Stone Tower Winery. Only four years old, Stone Tower is highly regarded as one of Loudoun’s newest staples. Enjoy a tour of the vast and beautiful property followed by a seated tasting in the Tank Room. Home to about 80 acres under vine, two separate tasting rooms and several private spaces, Stone Tower is a crowd pleaser. Make sure to bring a camera; the photo opportunities are endless. PM - Head south to the nation’s horse and hunt capital, Middleburg. Named for being the half-way point between Winchester and Alexandria, Middleburg is located along the John Mosby Highway and is home to a history heavily seated in the Civil War. Explore all the boutique shopping and grab lunch at local favorites including; Market Salamander, The Upper Crust, and Red Horse Tavern. Test your sommelier skills at another great Virginia winery, the Winery at LaGrange. Located at the foothills of the Bull Run Mountains, LaGrange is Prince William & Manassas’ first winery, in operation since the early 1900’s. Discover the art of Virginia wine-making, sip on samples and enjoy the beauty of the Bull Run Mountains. Your next stop is Ben Lomond Historic Site for a VIP tour. Used as a hospital after the First Battle of Manassas during the Civil War, your tour will take in the sights, sounds, and smells of what it was like to be a wounded soldier in July 1861. Your visit may include a cooking demonstration, musket firing demonstration, or other interactive experience. Enjoy your dinner with the owners of Murlarkey Distilling. All from the New England area, the owners will treat you as a member of their family where you’ll enjoy a relaxing and entertaining meal in the distillery or tasting room. Try one of their signature cocktails during your visit, made with their gourmet gin, vodka, or whiskey. AM - Receive a warm welcome to Occoquan by the mayor, Earnie Porta. Enjoy a guided tour of the quaint riverside town as he highlights the history and unique details of Occoquan. Discover stories of the historic buildings and how the town got its name. Board Miss Rivershore for a tour along the river and take in the beautiful scenery as your captain highlights details about the real estate and boats along the journey. You may even get to see a bald eagle! Free time to shop and explore Occoquan, lunch on own. Stroll the quaint shops of this historic waterfront town. All the stores are independently owned and feature a wide variety of items from Christmas decorations and dresses to antiques and pottery. Dinner in your hotel with a local Waterman and learn about life on the Chesapeake Bay and the Atlantic Ocean. This evening stroll on the iconic Virginia Beach Boardwalk and take a selfie with King Neptune, standing 34 feet tall welcoming residents and visitors alike. AM - Riding tour, to include Cape Henry Lighthouse and First Landing Cross. The Cape Henry Lighthouse silently guards the entryway into the Chesapeake Bay. Standing near the "First Landing" site of the Jamestown settlers where in 1607, Captain Newport raised a cross to offer thanks for their safe crossing of the Atlantic, the Lighthouse has stood sentinel since it was completed in 1792. Coastal history is alive and thriving at the Virginia Beach Surf & Rescue Museum. Standing proudly at 24thStreet on the Boardwalk, the museum building itself is a Virginia Beach icon on the National Register of Historic Places. Explore lots of fun exhibits and a great gift shop right on the boardwalk! Come explore over 800,000 gallons of one of the best aquariums and live animal habitats in the country at the Virginia Aquarium & Marine Science Center. Afterwards, enjoy lunch at the Osprey Café. Take a cruise and experience a chance to see bottlenose dolphins in their natural habitat and learn about the Aquarium’s research. This 90-minute excursion is both fun and educational for adults and children. Enjoy wine tasting at our new Mermaid Winery or afternoon tea at the Historic Cavalier Hotel. Dinner at Rockafeller’s with an Oyster tasting, learn why Virginia is for oyster lovers. Since 1989, Rockefeller’s Restaurant has been one of Virginia Beach’s favorite dining landmarks - well loved by locals and tourists alike for its casual elegance and simply fresh local fare. AM - Explore Back Bay National Wildlife Refuge by tram, traveling five miles into the scenic wild to look for signs of bobcat, fox, deer, coyotes and more. Hear stories of shipwrecks and early Virginia life as you collect seashells and spy ghost crabs. Depart for home along the Chesapeake Bay Bridge Tunnel – one of the seven engineering wonders of the modern world.